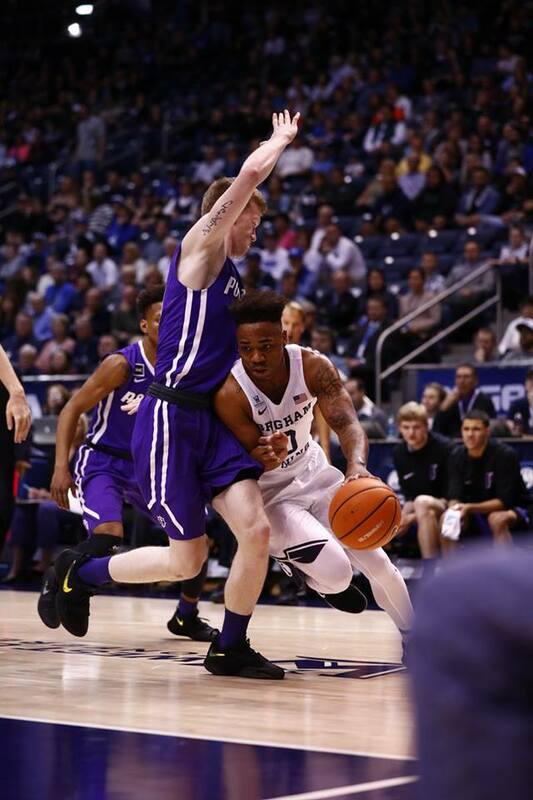 PROVO – Elijah Bryant’s and Yoeli Childs’ career nights helped push BYU men’s basketball past Portland 69-45 Thursday night at the Marriott Center to open West Coast Conference play. Childs led the Cougars with a career-high 26 points to go with 13 boards for a double-double. Bryant added 22 points and a career-high 15 rebounds for a second double-double. TJ Haws contributed eight points, six boards and four assists in the win. BYU (12-2, 1-0 WCC) grabbed the first four points of the game on buckets by Childs and Luke Worthington. Portland (6-8, 0-1 WCC) quickly countered with a pair of 3-pointers to take an 8-6 edge. A duo of Haws and Bryant shots pushed the Cougars ahead 19-11 with 10:16 left in the half. The Pilots followed with a 9-2 run to get back within one, down 21-20. Childs then scored on a dunk and a jumper to make it 25-20, forcing a Portland timeout. Childs continued to dominate down low, collecting back-to-back dunks to give BYU a 31-24 lead heading into halftime. After the break, the Pilots slowly worked their way back into the game, trailing by a point at 36-35 after the first media timeout. A Zac Seljaas jumper followed six-straight points from Childs, increasing the Cougar advantage back to seven at 46-39. Three layups from Bryant then pushed the lead to 17, 56-39, with just over six minutes left to play. BYU maintained its advantage from there, taking the game 69-45. Yoeli Childs scored a team-best 14 points in the first half on 7 of 11 shooting. He also added five rebounds and one block. He had double digit points in the first half for the third time in four games and sixth time this season. Childs finished the game with a career-best 26 points and a season-high 13 rebounds. It is his sixth double-double of the season and 11th of his career. Childs has scored in double figures 13 times this season. With two blocks against Portland, Childs has registered at least one block in all but two games this season. Elijah Bryant stuffed the stat sheet in the first half with 9 points, 7 rebounds, 1 assist, 1 block and 2 steals. Bryant finished the game with 22 points, 15 rebounds, two assists, one block and two steals. His 15 rebounds are a career high. This marks his first career double-double. Bryant has scored in double figures 10 times this season. The last time two Cougars had double-doubles in the same game was Feb. 4, 2017, vs. Portland. Eric Mika had 23 points and 12 rebounds and Childs had 15 and 10. Braiden Shaw played three minutes tonight, his first appearance of the season after missing the first 13 games due to an ankle injury. For the fifth time in six games and seventh time this season, BYU has shot 50.0 percent or better in the first half. The Cougars hit 14 of 27 for 51.9 percent against the Pilots. BYU finished the game shooting 50.0 percent from the field, its fifth in the last sixth games and eighth overall shooting 50.0 percent or better.